“Now you be a good kitty while we're gone. Sleep if you'd like and there is plenty of cat food in your dish. Goodbye, kitty.” Mrs. Zowski petted her cat and locked the door behind her. At first Tiger behaved himself. He slept for a while. He ate his cat food and scratched himself on the couch. He sat by the window for an hour waiting for Mrs. Zowski to come home. But as the time passed, he realized she wasn't coming home in time for supper. The cat pranced around the house. He sniffed out some chocolates and gobbled them up, leaving the wrappers on the floor in front of the mouse hole. Four gold fish swam around in the water. When they saw Tiger coming closer with this mouth wide open, they swam in circles trying to escape. Tiger took the fish bowl off the shelf and carried it upstairs to Mrs. Zowski's bed. He put his paw in the bowl and scooped out the four goldfish. When he finished eating them he drank all the water out of the bowl and left it lying on the bed. 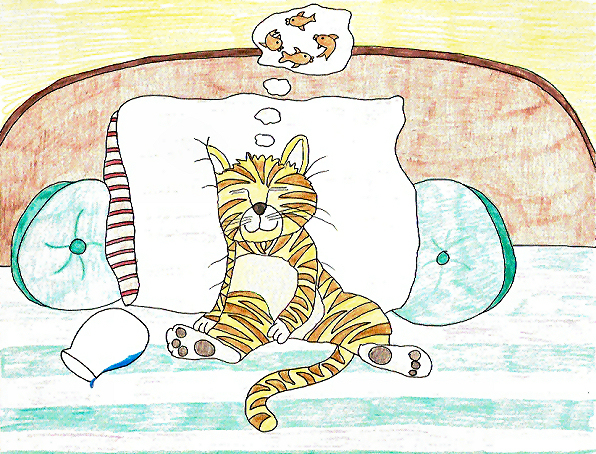 Falling asleep right away, Tiger's mind filled with dreams of goldfish and how delicious they tasted. A grin spread across his face. Bang! The front door slammed shut. Mrs. Zowski was home. Tiger woke up and saw the fish bowl lying next to him on the bed. He remembered eating the fish. “Uh oh.” He ran into the bathroom and filled the bowl up with water and then carried it downstairs, putting it back right where he'd found it. Mrs. Zowski stroked Tiger's neck. “Good kitty. I see you ate your food. Did you take a nap too.” Tiger purred and rubbed himself on her leg. Tiger pointed to the mousehole. “Oh, you did catch them. You ate them all up? Good. They didn't deserve to eat all my chocolates,” Mrs. Zowski said. Tiger ran over to Mrs. Zowski and let her stroke him again. He wasn't about to say a word. Let her blame the mice. Hee hee hee.